The Canadian Rockies mountain system comprises the southeastern part of this system, laying between the Interior Plains of Alberta and Northeastern British Columbia on the east to the Rocky Mountain Trench of BC on the west. The southern end borders Idaho and Montana of the USA. The Canadian Rockies have numerous high peaks and ranges, such as Mount Robson (Sometimes called Mount Bella) (3,954 m (12,972 ft)) and Mount Columbia (3,747 m (12,293 ft)). Much of the range is protected by national and provincial parks, several of which collectively comprise a World Heritage Site. Jasper National Park is the largest national park in the Canadian Rockies, spanning 10,878 km2 (4,200 sq mi). It is located in the province of Alberta, north of Banff National Park and west of the City of Edmonton. The park includes the glaciers of the Columbia Icefield, hot springs, lakes, waterfalls, and mountains. Wildlife in the park consists of elk, caribou, moose, mule deer, white-tailed deer, mountain goats, bighorn sheep, grizzly bears, black bears, coyotes, beavers, Rocky Mountain pikas, hoary marmots, gray wolves, mountain lions, and wolverines. It takes about 1-2 days to photograph the main areas of the park depending on how you cover it. If you are a photographer, who wants to spend time getting every angle and cover every square inch plan two days. The Columbia Icefields Parkway is one of the world’s most scenic drives that stretches 232km’s (144miles) between Lake Louise and Jasper. 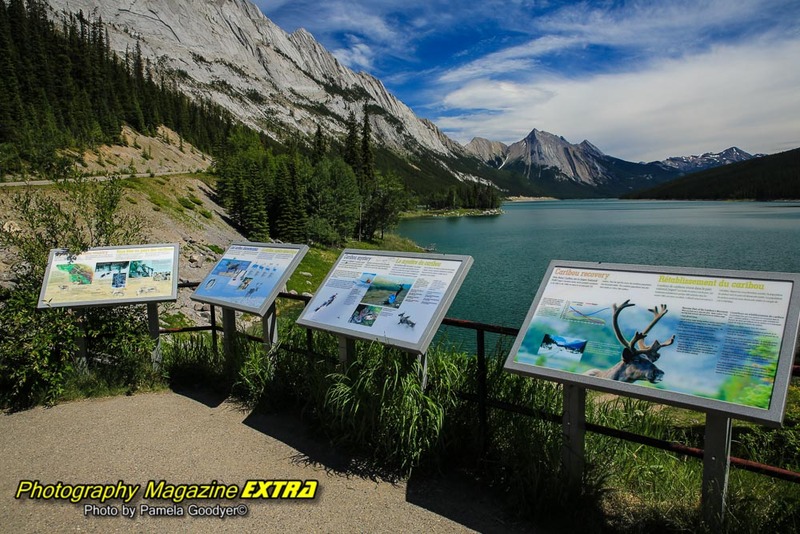 There are many great things you will be able to stop and photograph along the drive up icefield parkway to get to Jasper: Peyto Lake, The Columbia Icefields, The Glacier Walk and Bow Lake (one of our favorite spots on the planet earth.) Start your journey early up the Icefields Parkway towards Jasper. 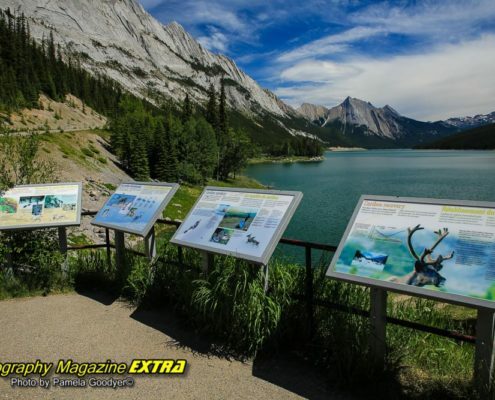 To see Bow Lake and Peyto Lake information in detail go to our Canada Hot Spot Page. There are several lakes in Jasper National Park, and the main tourist attraction is Maligne Lake, under a half hour drive from the center of town. The lake is covered with tourist if you go in the summer and parking can be a hassle. We went there for this article, but we probably will not go back. Jasper is a 4-hour drive up the icefield parkway to get there from Banff. There isn’t as much incredible dynamic scenery compared to the southern Canadian Rockies. The drive up Icefield Parkway has some stops that make this trip worthwhile, but we were not all that impressed with Jasper overall compared to the Banff area. Maybe we have just been too many incredible places in Banff, Yoho, and Revelstoke. The most marvelous spots on this journey are the waterfalls. Athabasca and Sunwapta are the two best places not to miss. Lake Maligne although beautiful, was covered by tourists in the summer. There are a few other lakes: Patricia and Pyramid that are good. The other lakes did not give us any dynamic photos. 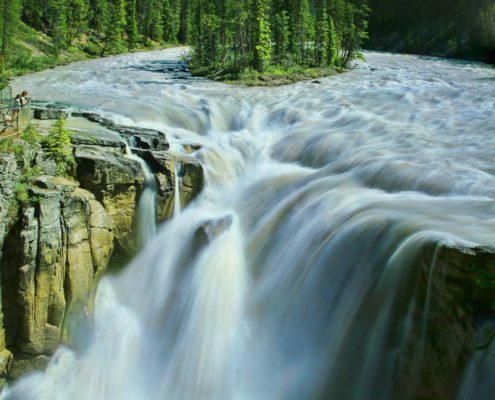 There is also Maligne Canyon to hike and photograph which gives the opportunity for some compelling images. The Maligne lookout is just a lookout. We call these pictures tourist shots from these type of locations. 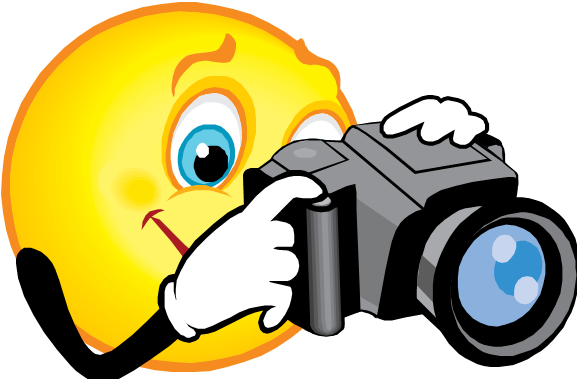 You can stop there and get some good images. Try to do something different than the same old shot of the island that every person in the world gets. Keep your eyes out for wildlife. There is an abundance of elk especially early in the morning. We went during a heat wave when wildlife is known to stay in the wilderness. We did see some bears on our journey. To see each individual Photography Hot Spot location of Jasper National Park go to our Canada Photography Hot Spot Page. To get the deep blue sky, white puffy clouds or the milky water effect you will need a circular polarizing filter and or a neutral density filter. Learn how to shoot waterfalls here. It is well worth the investment to get a tripod and a filter to create dynamic milky water effect waterfall images. Patricia Lake just a very short drive outside of the center of town is a beautiful photography spot. This image is one of our favorites from the trip. We did some excellent night photography at this location. We ventured out for sunrise photography at Annette Lake, and the road was closed off. The park opens after sunrise. We did not locate a good sunrise location. 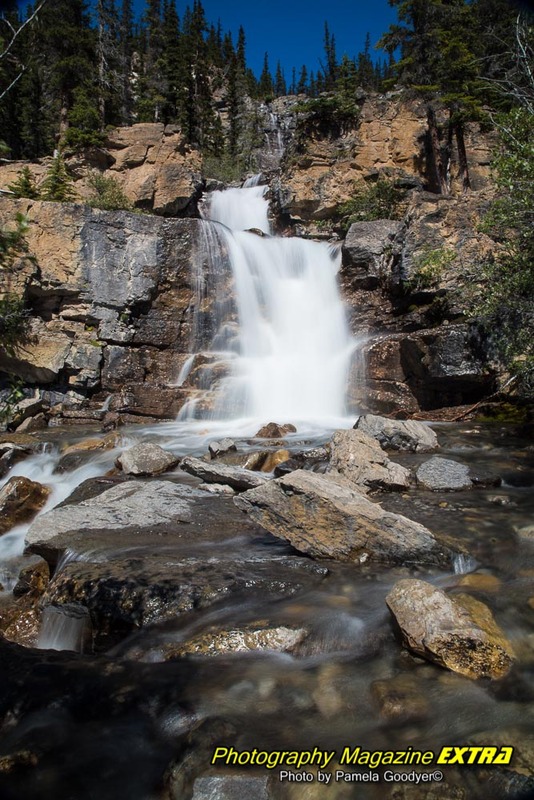 Tangle Falls – You will pass this going up the Icefield Parkway before you get to the town of Jasper. This was a quick stop for some photos. 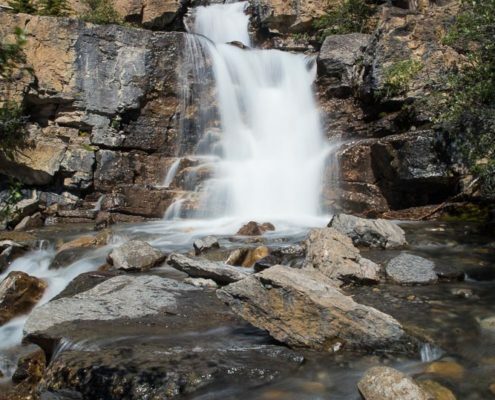 Sunwapta Falls – (Image to the right) It is accessible via a short drive off the Icefields Parkway that connects Jasper and Banff National Parks. The falls have a drop of about 18.5 meters. Sunwapta is a Stoney (Assiniboine) word that means turbulent water. It is most spectacular in the late spring when the spring melt is at its peak. This is the first stop when heading into the park. There are actually two falls, a lower and an upper one. The one most people see is the upper falls as access is easy. The lower falls are a short distance away. The water originates from the Athabasca Glacier, and volumes are higher in early summer, caused by a glacial meltdown. You MUST have an ND filter for waterfall photography. When to Go: Avoid the summer months and the bus people if you can. September and October are excellent times to go. Fall foliage can be unbelievably gorgeous in October. In November it starts to get cold, and ice and snow may arrive. After that, it’s a whole lot of cold. In March the thaw will begin, and after the first week of June, the tourist starts to arrive. I would pick October fall foliage as the best time to go. Lens: This area is a wide angle lens location and a zoom lens spot because you will see some wildlife. 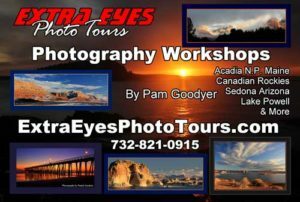 Gear: Bring your tripod and your circular polarizing filter. The CPL will make your white puffy clouds burst and deepen the blue sky color around them. It will also take the glare off the water and replace it with the reflection. Bring your tripod too. If there is not enough light when you are shooting, you will want to use it to get the depth of field, (higher F-stop). Don’t forget your ND filter you will want to shoot moving waters and get the milky blur. There is also lots of wildlife here so be prepared. Gear List at a Glance: Circular polarizing filter, neutral density filter, tripod, shutter release, wide angle, and zoom lens. You can shoot in Aperture Priority to get the depth of field (control how much is in focus) or shutter priority for your moving subjects (wildlife). You will want to do some landscape shots at a hyperfocal distance. That means your subject to infinity is in focus. Most formulas of hyperfocal distance, which are very complicated, lead you back to f11 or f13. When we are not in the mood for a long calculation, We shoot in aperture priority (A on your camera dial) at f11 when we want everything in focus. This is good when you want your foreground and background in focus. This is good for landscapes around the mountains. To do your long exposure running, milky water shots you will have to use a tripod. 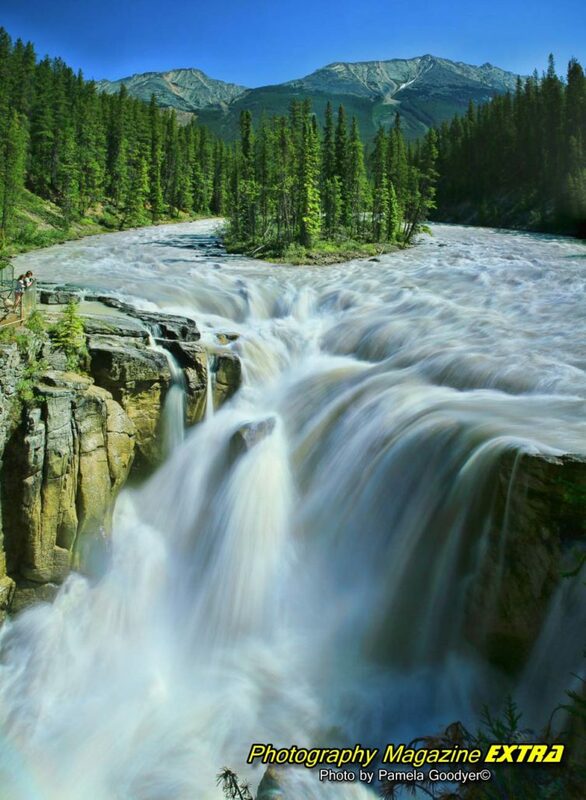 There are a lot of moving water areas in Jasper National Park. All of your settings will vary depending on the lighting and what neutral density filter you have. In the daytime, you may not get a milky water shot if the sun is out and you don’t have an ND filter. Shoot in Manual Mode for the milky waters. ISO is always 100 or as low as your camera will allow. Your shutter speed will vary depending on the light. Use your cameras built-in light meter to set your shutter speed. Take some test shots to decide on your shutter speed after you put your neutral density filter on. (It’s like sunglasses for your camera to stop light from coming in). Use your live view mode to focus to lock the mirror up and avoid any camera movement. Use your shutter release or your 2-second timer also to prevent camera movement. Voila. You now have your milky water exposure. You want at least a 2-second exposure for running water. If you don’t have a neutral density filter, you may not get more than 1/15th of a second in the sun. Go to our store to buy your ND filter. We have a 3.0 for super long exposure in the sunshine – You can go as long as 30 seconds. We have an ND 1.2 and an ND8 for shorter exposures. From a boat, you have to remember you are moving and have to account for the movement just as if your subject was moving. You’re moving instead, so it’s the same thing. We never saw any boat rentals so unless you find a local that wants to hang out I highly doubt you will out on a boat here. Shoot in shutter priority at least 1/200th of a second, depending on how fast you are moving and how fast your subjects are moving. Up the shutter speed if you have enough light. We don’t go over ISO 800 to avoid noise at any given time. 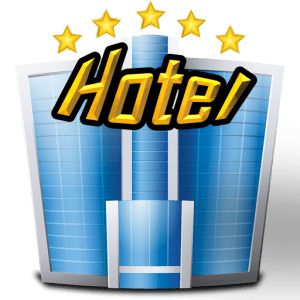 Passes – You must have a pass to visit the parks. You can purchase when you get there or before you go. Here is the link to the different types of passes. Seasonal Closures and Restrictions – Be sure to read this before you go. 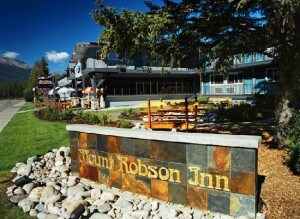 When Photography Magazine Extra and Extra Eyes Photo Tours are in Jasper National Park we stay at The Mount Robson Inn. 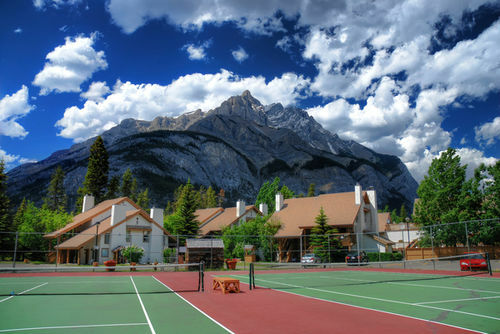 Banff Rocky Mountain Resort – our favorite place to stay when in Banff. Our Favorite Canadian Rockies Resort when in Banff National Park – Banff Rocky Mountain Resort – 1029 Banff Avenue, Banff – (800) 563-8764 in Canada/USA | +1(403)762-5531 Local – The Banff Rocky Mountain Resort is the perfect rocky mountain getaway for any traveler. They feature suites and condo style accommodation in Banff National Park. Stay with them and enjoy the comforts of home and more. This picturesque location has a dining room, a deli, tennis courts, health facilities, swimming pool, squash courts, and conference facilities. Take your vacation at Banff and live the mountain lifestyle. Jasper is a year-round camping destination and can accommodate anything from a one-person bivy tent to a 39-foot motorhome, and everything in between. At all campgrounds, firewood is included with the purchase of a fire permit, bear proof lockers are offered for safe food storage, and log cookhouses are available in case the weather isn’t cooperating. To maintain the family-friendly atmosphere that attracts millions here every year, quiet hours, including a liquor and fire curfew, are enforced by park wardens between 11 p.m. and 7 a.m.
You can reserve Whistlers, Wapiti, Wabasso and Pocahontas campgrounds online at www.reservation.parkscanada.gc.ca or by telephone at 1-877-RESERVE (1-877-737-3783). 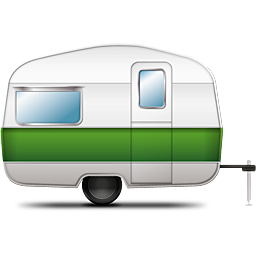 All other roadside campgrounds operate on a first-come, first served basis. at 780-852-6177 to make a booking. Visit pc.gc.ca/jasperbackcountry for further information on backcountry camping. Click here to check out the weather.